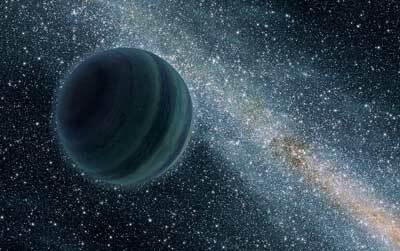 (Nanowerk News) Last year, the existence of an unknown planet in our solar system was announced. However, this hypothesis was subsequently called into question as biases in the observational data were detected. Now Spanish astronomers have used a novel technique to analyse the orbits of the so-called extreme trans-Neptunian objects and, once again, they point out that there is something perturbing them: a planet located at a distance between 300 to 400 times the Earth-Sun separation. Now, however, two astronomers from the Complutense University of Madrid have applied a new technique, less exposed to observational bias, to study a special type of trans-Neptunian objects: the extreme ones (ETNOs, located at average distances greater than 150 AU and that never cross Neptune's orbit). For the first time, the distances from their nodes to the Sun have been analysed, and the results, published in the journal MNRAS: Letters ("Evidence for a possible bimodal distribution of the nodal distances of the extreme trans-Neptunian objects: avoiding a trans-Plutonian planet or just plain bias? "), once again indicate that there is a planet beyond Pluto. "If there is nothing to perturb them, the nodes of these extreme trans-Neptunian objects should be uniformly distributed, as there is nothing for them to avoid, but if there are one or more perturbers, two situations may arise," explains Carlos de la Fuente Marcos, one of the authors, to SINC. "One possibility is that the ETNOs are stable, and in this case they would tend to have their nodes away from the path of possible perturbers, he adds, but if they are unstable they would behave as the comets that interact with Jupiter do, that is tending to have one of the nodes close to the orbit of the hypothetical perturber". The authors note that their study supports the existence of a planetary object within the range of parameters considered both in the Planet Nine hypothesis of Mike Brown and Konstantin Batygin from Caltech, and in the original one proposed in 2014 by Scott Sheppard from the Carnegie Institute and Chadwick Trujillo from the University of North Arizona; in addition to following the lines of their own earlier studies (the latest led by the Instituto de Astrof?sica de Canarias), which suggested that there is more than one unknown planet in our solar system. "Given the current definition of planet, this other mysterious object may not be a true planet, even if it has a size similar to that of the Earth, as it could be surrounded by huge asteroids or dwarf planets," explains the Spanish astronomer, who goes on to say: "In any case, we are convinced that Volk and Malhotra's work has found solid evidence of the presence of a massive body beyond the so-called Kuiper Cliff, the furthest point of the trans-Neptunian belt, at some 50 AU from the Sun, and we hope to be able to present soon a new work which also supports its existence".